Ya gotta love the Italians. While North American newspapers are struggling to survive and 5 major American magazines ceased publication last week alone, Italy has launched a monthly Jewish newspaper, to be sold on newsstands, essentially for non Jews! Banking on Italy's fascination with all things Jewish, Pagine Ebraiche is published by Italy's version of the Jewish Federation, but its aim is to link the Italian Jewish community with the wider Italian world. Rome, of course, is said to be home to the oldest continuously Jewish population outside of Israel. The impetus behind them is the UCEI's desire to confront a seeming paradox: Italians are fascinated by things Jewish even though the country's 30,000 Jews comprise a tiny fraction of the population of 60 million. "There is a huge interest in Jews and Jewish culture here," said Emanuele Ascarelli, who directs “Sorgente di Vita” (“Source of Life”), a biweekly Jewish television program co-produced by UCEI and state-run RAI television that draws 200,000 to 400,000 viewers. Ascarelli estimates that 90 to 95 percent of them are not Jewish. Ascarelli says the new media initiatives reaching out to the non-Jewish world reflects a new self-confidence among Italian Jews. Meanwhile, here in Atlanta, the state of Jewish publishing is absolutely dismal. The Atlanta Jewish Times has ceased to have an online presence and circulation under the new editor has plummeted. The Jewish Georgian, bless its heart, continues to publish. My post on trying to like boiled peanuts has gotten lots of hits, but hasn't won me many fans down here in the land of cotton. I just wasn't liking 'em . . . that is, until this past weekend in Charleston, SC. There I had lunch at Hyman's Seafood, a Charleston institution owned and operated the very entrepreneurial Hyman family, (MOT's) who own just about a whole city block of prime real estate on Meeting Street. It's a seafood and deli palace, very popular with tourists and locals alike. You wait and wait on line, and when you sit down at the table you get . . .
. . . a crock of crab dip and a dish of boiled peanuts. Please notice they are wet boiled peanuts, just out of the pot. They are warm, salty, briny and completely addictive. I now humbly take back all I've said about boiled peanuts tasting like mealy mush, and salute the official snack food of the state of South Carolina. Atlanta, as I often I tell my visitors, is a city of with an unusual number of major landmarks and institutions that start with the letter "C". We have Coca Cola, the CDC (Centers for Disease Control), and The Carter Center (Jimmy's Presidential Library), and CNN. Our largest outdoor concert venue is Chastain Park. The 1996 Olympics gave the city Centennial Olympic Park. We are the national headquarters for CARE, and the American Cancer Society. We have this nutty thing called Cyclorama, which is a rotating panoramic painting of the Civil War. And, now, after my Thursday night adventure, I must add one more: The Clermont Hotel and Lounge on Ponce de Leon Avenue. The Clermont is to Atlanta, what the Chelsea Hotel is to New York...legendary, beloved, authentic, sleazy, singular. See The Clermont's My Space page. (FYI: Rooms currently rent for $37.50 a night...it's posted out front.) The Clermont Lounge is Atlanta's oldest continually running strip joint, or so says Wikipedia. I'd been curious, but never had the cojones to go until last night, when HEEB magazine had a Jewish storytelling event at the Clermont. Perfect venue. The evite said, doors open at 7:45, show begins promptly at 8:00. So I got there on time. To my immediate right, an oval bar with a platform in the center. Up top, a big honking white mama in thong and bikini top shaking her considerable derriere. Major cellulite. Booty-ful in an obviously Clermontesque way. Dancers and strippers apparently rule at the Clermont ... patrons can put coins in the juke box, but ONLY the dancers can call the tunes. It says so right on the juke box. Around the bar, old buys sipping PBR's, younger folks throwing back shots. There's nothing "on tap." Cans and bottles of beer only. Smoking is allowed, natch, which made it a pretty yukky to place to be. The Heeb event was on the left side of the joint. Stage, nightclub style seating, and about 40 people present to hear 7 people each tell a 7 minute "Jewish" story. My friend Rachel P. got up and told about moving to Atlanta in 7th grade, being unpopular and then having her mother force her to run for class president. The publisher of Heeb told about seeing the movie "10" at the age of 8 and having no idea what was going on. A black lesbian Jewish woman riffed on being a black lesbian Jew -- "I needed the trifecta of outsider-ness." A 60-something pony-tailed civil liberties lawyer (he represents the Clermont) told about being a Jewish lawyer defending a criminal who got religion and got off in court. We were out by 10:00, and believe me, I was gasping for air and grateful. So now I can say, I've been the the Clermont. Even my teenager was creeped out by this story. We did it! 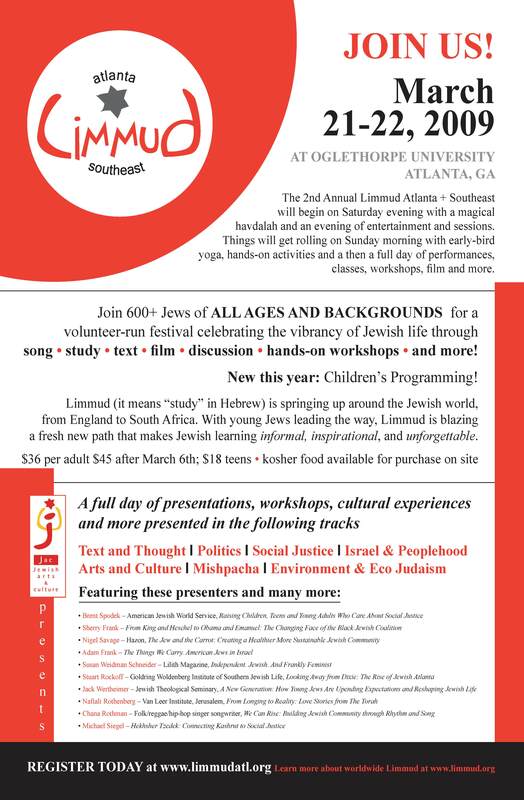 More than 600 people attended the very first Limmud Atlanta + Southeast at Oglethorpe University on Saturday and Sunday. As one of the organizers of this mammoth project, nine months in the making, I'm proud, exhausted and excited that the inaugural Limmud touched so many people so positively. Limmud (lee-MOOD, from the Hebrew word to study) started in the U.K. 28 years ago as British Jewry's response to the omnipresence of Christmas. It is now an international movement happening in Europe, Israel, Turkey, Russia, Australia, New York, L.A., and now Atlanta. The original organizers envisioned a study retreat that happens on an empty college campus for 4-5 days during the Christmas holiday. Limmud offers learning sessions, performances and workshops from dawn to the wee hours. It's a dizzying experience to attend Limmud in the U.K., as I have, two times. You truly have to pace yourself for the hundreds of fascinating events that unfold. More times than not, the social experience at Limmud eclipses the learning. Limmud is a friendly, informal and egalitarian environment where everyone's badge simply bears their name and hometown. There are no titles, no grandstanding, no hierarchy. The diversity is amazing: under-20's, 30-somethings, and octogenarians study together. Orthodox, Conservative, Secular, atheist Jews and just about anybody who identifies with the tradition is drawn to Limmud. Nobody gets paid to teach or perform. It's not intimidating. The spirit is learning for its own sake. Our southern fried Limmud had its own special feeling. We did it on a shoestring. We did it without the Jewish Federation. We did it with heart and soul, and we will be back next year even bigger and better.